As a small-business owner or manager, it's not easy keeping up with technology -- particularly if your business isn't data- or technology-driven. In our second installation in this series, we look at a few more buzzwords -- and why you should care about them. It wasn't long ago when most of the products that you bought or craved at Best Buy weren't allowed at the office. You were issued a standard, sluggish PC, installed with pre-approved, cumbersome applications. Wireless networks inside the building? Forget about it. Well, that's all changed, and now people bring their latest hot-off-the-shelf tools to work. "Consumer IT" refers to how companies are adopting technology based on what employees want, instead of forcing tools on them. This CIO article explains why employees won't use "clunky enterprise software" anymore, demonstrating how the tide has changed in favor of workers. For a small business, this is fantastic news. You no longer have the pressure to invest in and support costly customer-relationship-management or collaboration applications. Instead, for a much smaller chunk of change, you can subscribe on the Web to get all the tools you need to run your business. You may not even need to buy PCs or phones for your employees -- they'd probably rather bring their own. The BYOD (bring your own device) culture is here to stay, so go with it! Just as happened with "the cloud," it seems as if every major tech vendor has a "big data" strategy and product. The philosophy behind big data is that companies and organizations have been steadily acquiring mountains of data, and they want to make some use of it. Usually, the existing infrastructure of even a large company may not be able to handle crunching large data sets to provide quick and useful analysis that could save money or direct a new product strategy. So, application developers are using a free open-source platform called Hadoop (from Apache) to help companies more cheaply do the job using parallel processing and cluster computing. That may sound like a project more suited for Bank of America or NASA rather than your small business, but someday, small companies will be able to take advantage of this supercharged form of business analytics. This recent Business on Main article discusses how big data could spark new innovations and startups. You've seen the above security terms before -- in fact, they've been around for quite some time. But is there any real need for so many terms to describe what's essentially a piece of malicious code that attacks your computer and sometimes spreads to other computers, disabling your network and even taking down your entire business? SearchSecurity defines a virus as "code that replicates by being copied or initiating its copying to another program, computer boot sector or document." Cisco classifies viruses (along with worms, Trojans and bots) as "malware," which the company defines as code or software that is designed "to damage, disrupt, steal or in general inflict some other bad or illegitimate action on data, hosts or networks." Cisco notes that most malware is triggered by users downloading files or forwarding e-mails. That's right -- it's all your fault! Then there's spyware, which downloads to your PC to collect information about you and your online behavior so marketers can target you. Spyware can also do a bunch of other weird things while you're surfing, just to get you to buy something you probably don't want. Shame on you for surfing the Web! All you really need to know is that there are easy, cheap ways to prevent these nasty programs from infecting your PC, through regular cleansing sweeps using antivirus and anti-spyware software. Most tools are free and can run in the background on your PC. The wireless industry is notorious for creating highly technical terminology to describe its products and specifications. There's probably a conspiracy here -- is there something these big companies don't want us to know? The fourth generation of cellular communications technology, 4G, is one example. "I understand how fast Gigabit Ethernet can transfer data," remarks Lee Schlesinger, an application specialist with the New York Botanical Garden. "How fast is 4G? I know the answer, but the label doesn't say it." This reporter from Mashable sums it up well: "4G promises faster speed and better coverage. 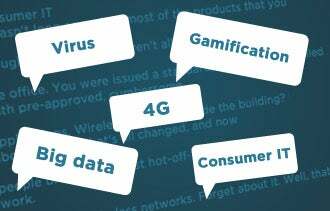 But it also represents a confusing mish-mash of competing standards and marketing speak -- there's no single 4G technology." Whether it's worth upgrading to 4G depends on how frustrated you are with your 3G phone. It's probably wise to thoroughly research the model of phone you want since real speed will depend on the hardware, plus other factors, such as network congestion in your area. Here's just one of many demos of 4G speeds. What do games have to do with work, unless you're a gaming company? Companies are increasingly integrating gaming concepts into their websites to add some fun to their marketing, offering visitors status and rewards for playing games. It's the kind of supercharged loyalty program that typically only large companies can afford, says Gabe Zichermann, an author of gamification books and chair of the annual Gamification Summit. In his blog, Zichermann describes this emerging area as "the use of game thinking and game mechanics to engage audiences and solve problems." Can you afford it? There are a slew of gamification companies that offer free or low-cost gaming tools you can integrate into your online marketing or employee motivation programs. If you think you have a playful, digitally motivated audience, gamification could help you grow your business. In case you missed the first article in this series, check out how we define cloud, crowdsourcing and other confusing buzzwords.